I should qualify that statement. 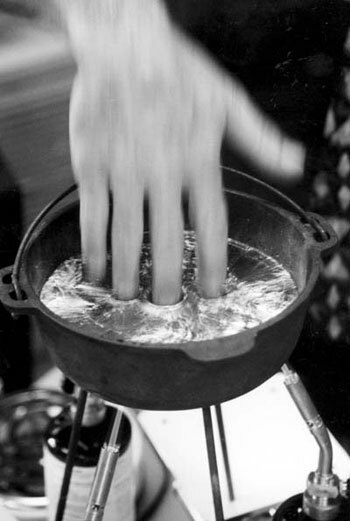 If you have a hot enough pot of lead and coat your hand with water right before you dip it in, then you can very quickly insert your hand into the lead without any harm being done to you. No really. You could in theory pull this off (but shouldn’t try it). What is going on here is rather straight forward. What allows you to dip your water covered hand into molten metal is called the Leidenfrost Effect. When a liquid comes into contact with a surface or medium that is much hotter than the boiling temperature of that liquid, the surface of the liquid quickly comes to a boil and creates a thin layer of steam (if the liquid is water) that acts as a barrier between the liquid and the surface or medium. When a heated metal ball is submerged in water, the surface of the water that is touching the ball rapidly comes to a boil, creating a thin layer of air between the water and the ball. This is what keeps the molten lead from coming into contact with your skin and giving you horrible burns. Applying this effect to sticking your hand into molten lead, by submerging your hand into water and then directly into the lead, the water on your hand quickly boils in the lead and creates a layer of gas that separates the molten lead from your skin. Of course, if you leave your hand in too long, the water evaporates away and you will most likely be maimed. However, if you do it correctly, you can come away from this little stunt unscathed. Keep in mind that you need all of the conditions to be perfect (correct temperature lead, enough water coating the hand, etc.) so I do not recommend trying this at home. The same effect explains why liquid nitrogen droplets scuttle along the floor when it is poured out. Because the air surrounding the liquid nitrogen droplet is far above the boiling point of the liquid nitrogen, a thin layer of nitrogen gas envelops the surface of the droplet. In effect, the droplet is suspended by gas like a hovercraft. The Leidenfrost effect also explains why water scurries across a hot stove. At first glance it seems like a magic trick, but it is really an amazing application of science! I can not get past the Darth Vader voice.